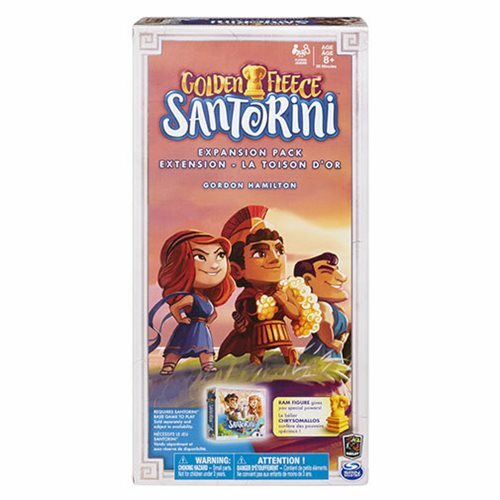 Harness the power of the Gods and play on a whole new level with the Santorini Golden Fleece Expansion Pack! Adding numerous gaming possibilities, the expansion pack makes the game of Santorini even more exciting! The Golden Fleece can take on the powers of one god. If builders are positioned next to the Golden Fleece, they absorb the selected god's powers. Play with 15 more God Cards, 10 Hero Cards, builders, and God Power Tokens. Add the beautiful ocean board around your existing game board and you can play like a God! The Santorini Golden Fleece Expansion Pack is for 2-4 players. Ages 8 and up.